Karmelle Solutions are UK specialist in liquid filling and capping solutions; we focus on the design, manufacture, and installation of liquid filling machines. Liquids have to be poured into bottles at an incredible volume in the food and drink, pharmaceutical, cosmetics, chemicals, and oil industries; and we work to help our customers fill and cap their products quickly and efficiently. We have more than 30 years of experience in our industry – and we offer a wide range of equipment for cost effective solutions. Our process begins with consulting clients, surveying processing cites, and custom-designing machinery (to be installed by our team) that meet the customer’s exact requirements. And our range of liquid, capping, and labelling machines, help us meet every stage of your liquid processing needs. We offer a range of automatic filling machines – used to fill containers with liquids. All of our models are modular; extra filling heads can be added for increased productivity. These products are built with stainless steel and are designed to meet EC environmental regulations. The product comes with a 100 litre tank, automatic drip tray, and several other features for clean and efficient operation. And we supply a volumetric filler, in one litre or five litres models, with cylinders controlled independent of the main machine. Please visit our website for details. 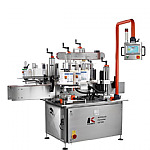 We offer semi-automatic filling machines for small-size or medium-size filling batches. Our Bench Top Filler is idea for small volumes. We also offer larger units for medium-size filling processes – with single or twin head designs. And the Boom Arm filler is ideal for larger-volume jobs where only a semi-automatic process is suitable; the boom arm is handled by an operator. These products are built with stainless steel and are designed to meet EC environmental regulations. Please visit our website for details. Our EK40 capping machine is ideal for medium-sized batches of capping bottles of liquid. This machine can achieve capping speeds of up to 28 one-litre bottles per minute. And the EK40 is designed to allow fast changeover to different caps – making it a versatile industrial product. This product is built with stainless steel and are designed to meet EC environmental regulations. Please visit our website for details. We supply a range of self-adhesive labelling machines. Our products start with a simple flash labeller and go up to a mainframe labelling system for heavy-duty capping lines. Our front-and-back labeller can be used for products that require double-sided or wrap-around labels. We also offer a pallet labelling for end-of-line labelling. All of our machines are built in durable stainless steel. Please visit our website for details. We produce a range of spare parts for our products. And we offer full customer and technical survive. We are proud of our team of engineers, with years of experience, who can deal with any technical issues and at a very quick response rate. And our cutting-edge facilities allow us to produce genuine spare parts with most items available for next-day shipping or delivery. Please see our website for details. We offer filling, capping, and labelling solutions, for a wide range of food and drink products; we can fill products with liquid and viscous products with an accuracy of ±0.2%. Karmelle machines can be used for yoghurt, juices and water, sauces, syrups and honey, edible oils, and dairy. Please visit our website for details. We offer filling, capping, and labelling solutions, for a wide range of pharmaceutical goods and veterinary products. Our products can be used in the context of increased demand and ever-more stringent regulatory regimes and requirements. And our machines operate to the highest standards of hygiene. Creams, pastes, ointments, gels, and medicines, can all be filled and capped with our equipment. Please visit our website for details. We offer filling, capping, and labelling solutions, for a wide range of cosmetics and toiletries. And our products can accurately and cleanly meet your industrial requirements. Our machines can fill containers with liquids, lotions, creams, gels, lip balms, and body washes. Please visit our website for details. We offer filling, capping, and labelling solutions, for a wide range of chemicals and agrochemicals. Our machines can be used to fill general chemicals, household cleaning and bleaching products, paints and varnishes, pesticides, herbicides, crop nutrients, fertilisers, and other chemicals. Please visit our website for details. We offer filling, capping, and labelling solutions, for a wide range of lubricants for the automotive and other industrial fields. Our fillers are perfect for filling containers with a large range of volumes, depending on the machine; and in addition to lubricant our machines can also be used for filling and capping fuel additives. Please visit our website for details. If you've any questions about Karmelle Ltd products or services feel free to ask them here.